“It’s more than just a place to sleep”, at least that’s what our guests tell us. What amenities do travelers want or need in a high end bed and breakfast? Do guests on vacation need a different experience than business travelers? How can we best accommodate them both? There are many details to consider and sometimes what is left out is just as important as what is included. Here is what we provide for all our guests. Fun, eclectic décor that’s a blend of modern and antique. Modern like the colorful Flor carpet tiles in every room, Blended like the headboards made from old doors original to our house but custom mounted in stylish Pecan wood frames made by local furniture maker Mockingbird Domestics, Antique like the marble top dressers in each bedroom that are so solid and well-built they just work. Modern King size beds with all organic mattresses, fine Sferra cotton linens, and SmartSilk silk filled pillows & comforters. All hypoallergenic and as one guest said “insanely comfortable”. No cramped, antique beds here. 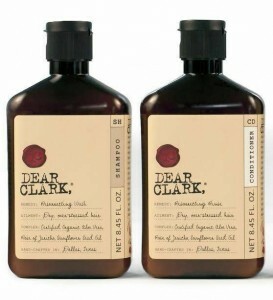 Each bath comes with a supply of luxurious, natural, made in Texas, Dear Clark hair care products. Our guests like them so much we may have to start selling them. For those of you who wrote us about this, yes we do provide a hair dryer in each room. Thank you for asking! We also stock our bathrooms with makeup remover wipes (that help keep our super plush towels nice and white), ear plugs (for those of you who are light sleepers), and we keep a handy supply of toothbrushes, toothpaste and other items that sometimes go missing. Don’t hesitate to ask if you need anything. Even though City of Austin tap water is very clean and safe to drink, we like to treat our guests extra special. A bottle of filtered water, usually flavored with a sprig of mint from our organic garden, is placed in each room daily. Isn’t that nice? Keyless door locks with unique codes for each guest unlocking both the doors to the main house as well as the guest room door. We program these wirelessly to become active on check-in and deactivate on checkout – it’s a safety thing. Free Wifi of course. But – it’s one thing to just hang your internet service provider’s basic Wifi access point up and hope it covers the whole house, it’s another to completely re-wire a network infrastructure with commercial grade Ubiquity gigabit routers and multiple wireless access points both inside and outside the house to ensure optimal Wifi coverage everywhere. Guess which approach we took. Oh, and we have the fastest internet plan we can get in Austin. We were the first in our fiberhood to sign up for Google fiber which was installed January, 2016. Come on Gigabit Internet! TV? Yeah, we got that covered too with brand new HDTV’s in every guest room. Google provides our TV service too so you can watch a whole bunch of your favorite channels. But wait! Are you having the “57 channels but nothin’ on” problem? Why not binge a little Netflix instead. Just hit the Menu button on the TV remote and you’ll find it there. Breakfast is a self-serve buffet. Ready to see the town? Come down as early as 7:30am to grab a quick bite and head out. Partied way too late the night before? Breakfast is available until 11:00 am if you feel the need to sleep in. But just because it’s a buffet doesn’t mean it’s not good food. Homemade bread made from organic, gluten free flour, sliced for toasting and served with butter and sometimes homemade preserves. Yumm! Our wonderful, old-fashioned home actually has a butler’s pantry just off the dining room. Imagine that, a butler’s pantry! Unfortunately the house didn’t come with a full time butler. Not to worry though, we set everything up to be self serve so our guests can just butler themselves all day long. Coffee! 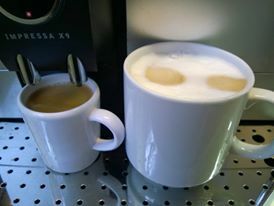 We have the coolest Jura coffee machine that will make a coffee, espresso, cappuccino or a latte all at the push of one button. Just grab a pre-warmed coffee mug, place it under the spout and make your selection. Oh, and it grinds the beans fresh for each cup. Rather have a spot of tea instead? 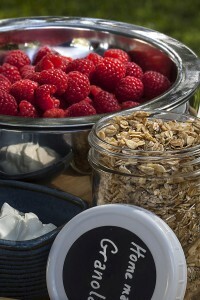 The butler’s pantry is stocked with a selection of black teas, green teas, and herbal teas. Choose your flavor and fill your pre-warmed mug with filtered water that is heated to just the right temperature for tea by our Zojirushi hot water pot. By the way, we’ve nicknamed these two “Zoey” and “Perky”. Can you tell which is which? We also have bottles of sparkling water available at all times. Choose from either Pellegrino (always a classic) or Topo Chico (if you like a little more fizz in your life). Pour a glass there or take a bottle with you. Just remember, it’s important to stay hydrated!